For other uses, see Tatsu (disambiguation). 3 trains with 8 cars. Riders are arranged 4 across in a single row for a total of 32 riders per train. Tatsu is a steel flying roller coaster designed by Bolliger & Mabillard at the Six Flags Magic Mountain amusement park located in Valencia, California, United States. Announced on November 17, 2005, the roller coaster opened to the public on May 13, 2006 as the park's seventeenth roller coaster. Tatsu reaches a height of 170 feet (52 m) and speeds up to 62 miles per hour (100 km/h). The roller coaster is also the world's tallest and fastest flying coaster; is the only flying roller coaster to feature a zero-gravity roll; and has the world's highest pretzel loop. It was the world's longest flying coaster until The Flying Dinosaur at Universal Studios Japan surpassed it in March 2016. In the roller coaster's opening year, it was named the 40th best roller coaster in the world in Amusement Today's Golden Ticket Awards; in Mitch Hawker's Best Steel Roller Coaster Poll, the roller coaster placed at 34th position. Rumors of a new roller coaster being built at Six Flags Magic Mountain first emerged in the summer of 2004. Land clearing began in mid-2005 around the Samurai Summit area of the park with track for the new roller coaster soon later beginning arriving from Ohio. 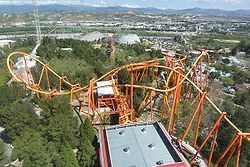 Construction permits filed by Six Flags Magic Mountain and a trademark for the name Tatsu (filed on August 23, 2005) were later found by the public. 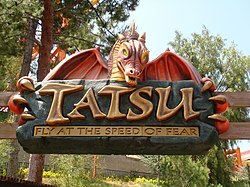 Tatsu was officially announced to the public on November 17, 2005. Both Revolution and Roaring Rapids were temporarily closed in order for the roller coaster to be built. After construction and testing was complete, Tatsu opened to the public on May 13, 2006. Tatsu broke several records upon its opening. The roller coaster is the world's tallest, fastest, and longest flying roller coaster. The roller coaster also holds the record for the highest pretzel loop which is 124 feet (38 m) high and is currently the only Flying roller coaster to have a zero-gravity roll. Seats are boarded normally, then rotate 90 degrees into flying position once engaged. After the train has been moved into the horizontal position and is dispatched from the station, depending on which station the train is in (Tatsu has two stations), the train will either make a left or right s-bend towards the 170-foot (52 m) lift hill. Once at the top, the train makes a sharp 111-foot (34 m) downward right turn reaching a maximum speed of 62 miles per hour (100 km/h). After the train makes it to the bottom of the drop, the train makes an upward right turn leading into the first inversion, a 103-foot (31 m) tall corkscrew. Next, the train makes a downward left turn immediately followed by an upward left turn into a 96-foot (29 m) zero-gravity roll. After the train exits the roll, it drops back down before going through a 84-foot (26 m) horseshoe. Following a left turn, the train then enters the record-breaking 124-foot (38 m) pretzel loop. Upon exiting the pretzel loop, the train makes a slight left turn before going through an inline twist. The train then makes a 135 degree downward right turn before rising back up slightly and going through the mid-course brake run. After exiting the brake run, the train makes a slight downward and upward left turn leading into the final brake run. The train then enters one of the two stations where the trains are put back into the vertical position for the riders to load and unload. One cycle of the ride lasts about two minutes. Tatsu operates with three steel and fiberglass trains. Each train has eight cars that can seat four riders in a single row for a total of 32 riders per train. Each seat has its own over-the-shoulder-restraint and a pair of ankle restraints to hold the riders' feet in place. The trains are painted green, yellow, orange, and red. In the station, the trains are oriented in a vertical position in order to allow riders to board. Once the restraints are locked, the train seats are rotated forward 90 degrees into a horizontal position and the train is then dispatched from the station. When the train returns to the station, the seats rotate back down and the riders disembark for the next guests. The steel track of Tatsu is approximately 3,602 feet (1,098 m) long and the height of the lift is approximately 170 feet (52 m). To slow the train down, air brakes are attached to the track throughout the two brake runs. The track was fabricated by Clermont Steel Fabricators in Batavia, Ohio, which manufactures Bolliger & Mabillard's roller coasters. The track is colored red and yellow while the supports are orange. In January 2017, the coaster closed temporarily due to a chain lift error which required a complete replacement of the lift chain. The ride reopened in March 2017. Joel Bullock from The Coaster Critic gave Tatsu a nine out of ten for its close-to-the-ground approaches and intense pretzel loop at the bottom of the element. Justice from Park Thoughts also gave the roller coaster a nine out of ten saying that, "The lift hill is one of the most suspenseful I have ever experienced." Justice also praises the ride's intense g-forces experienced throughout the layout of Tatsu. In 2006, Discovery Channel's Mega Builders aired an episode which followed the construction of Tatsu. The episode showed how the coaster was assembled and the problems construction crews had to overcome. In Tatsu's opening year, it was named the 40th best steel roller coaster in the world in Amusement Today's Golden Ticket Awards; tied with Talon at Dorney Park. It peaked at 28th place in 2012. ^ a b "Six Flags Magic Mountain". Screamscape. Archived from the original on March 7, 2005. Retrieved July 25, 2013. ^ a b "Tatsu". Coaster-Net. January 4, 2013. Retrieved July 25, 2013. ^ "Tatsu". United States Patent and Trademark Office. Retrieved July 25, 2013. ^ Six Flags (November 17, 2005). "The newest Six Flags "Species of Fear" revealed" (Press release). PR Newswire. Retrieved January 12, 2013. ^ a b c d Marden, Duane. "Tatsu Press Release (Six Flags Magic Mountain)". Roller Coaster DataBase. Retrieved July 14, 2013. ^ Marden, Duane. "Tatsu (Six Flags Magic Mountain)". Roller Coaster DataBase. Retrieved July 25, 2013. ^ "Roller Coaster Search Results — Flying coasters, sorted by height". Roller Coaster Database. Retrieved December 19, 2012. ^ "Roller Coaster Search Results — Flying coasters, sorted by length". Roller Coaster Database. Retrieved December 19, 2012. ^ "Roller Coaster Search Results — Flying coasters, sorted by speed". Roller Coaster Database. Retrieved December 19, 2012. ^ "Roller Coaster Search Results — Flying coasters with zero-G roll". Roller Coaster Database. Retrieved December 19, 2012. ^ "Roller Coaster Search Results — Flying coasters with Pretzel Loop, sorted by height". Roller Coaster Database. Retrieved January 13, 2013. ^ "Tatsu Front Row Seat on-ride POV Six Flags Magic Mountain". Coaster Force. YouTube. December 29, 2009. Retrieved January 8, 2013. ^ "Tatsu: Six Flags Magic Mountain". Six Flags. Retrieved July 24, 2013. ^ a b "Tatsu, The Newest Addition At Six Flags Magic Mountain". ABC 7. May 11, 2006. Archived from the original on July 26, 2013. Retrieved July 25, 2013. ^ a b Marden, Duane. "Tatsu Photo Gallery (Six Flags Magic Mountain)". Roller Coaster DataBase. Retrieved July 25, 2013. ^ "Scott & Carol Present: Getting On Track With B&M". NewsPlusNotes. December 11, 2008. Archived from the original on February 26, 2013. Retrieved July 23, 2013. ^ "Typical Clermont Steel Fabricators". Clermont Steel Fabricators. Retrieved January 31, 2013. ^ Guido, Anna (November 7, 2005). "Steel plant's business on fast track". Cincinnati Enquirer. Archived from the original on January 7, 2006. Retrieved February 6, 2013. ^ "SFMM Justice League Update #3". Park Journey. January 21, 2017. Retrieved 2017-05-14. ^ Bullock, Joel (February 15, 2009). "Tatsu @ Six Flags Magic Mountain". The Coaster Critic. Retrieved July 23, 2013. ^ "Review: Tatsu at Six Flags Magic Mountain". Park Thoughts. March 15, 2010. Retrieved July 25, 2013. ^ "Top 50 steel Roller Coasters" (PDF). Amusement Today: 26–27B. September 2006. Archived from the original (PDF) on October 19, 2013. Retrieved September 8, 2013. ^ "Top 50 steel Roller Coasters" (PDF). Amusement Today. 11 (6.2): 36–37. September 2007. Archived from the original (PDF) on October 19, 2013. Retrieved September 8, 2013. ^ "Top 50 steel Roller Coasters" (PDF). Amusement Today. 12 (6.2): 36–37. September 2008. Archived from the original (PDF) on October 19, 2013. Retrieved September 8, 2013. ^ "Top 50 steel Roller Coasters" (PDF). Amusement Today. 13 (6.2): 32–33. September 2009. Archived from the original (PDF) on October 19, 2013. Retrieved September 8, 2013. ^ "Top 50 steel Roller Coasters" (PDF). Amusement Today. 14 (6.2): 34–35. September 2010. Archived from the original (PDF) on October 19, 2013. Retrieved September 8, 2013. ^ "Top 50 steel Roller Coasters" (PDF). Amusement Today. 15 (6.2): 38–39. September 2011. Archived from the original (PDF) on October 19, 2013. Retrieved September 8, 2013. ^ "Top 50 steel Roller Coasters" (PDF). Amusement Today. 16 (6.2): 36–37. September 2012. Retrieved September 8, 2013. ^ "2013 Top 50 steel Roller Coasters" (PDF). Amusement Today. 17 (6.2): 34–35. September 2013. Archived from the original (PDF) on October 19, 2013. Retrieved September 8, 2013. ^ "2014 Top 50 steel Roller Coasters" (PDF). Amusement Today. 18 (6.2): 46–47. September 2014. Retrieved September 8, 2013. Wikimedia Commons has media related to Tatsu. This page was last edited on 4 January 2019, at 20:05 (UTC).